Scathing exchanges were witnessed inside the state assembly on Tuesday between Deputy Chief Minister Sushil Kumar Modi and Tejashwi over crime graph of the state and benami property. 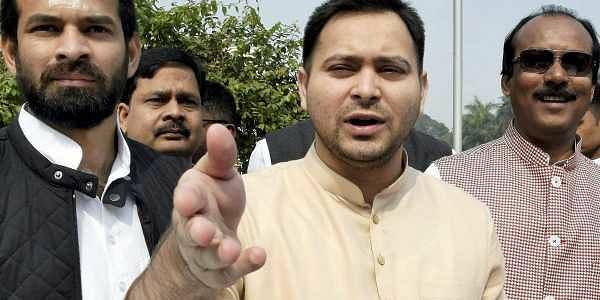 PATNA: Rashtriya Janata Dal (RJD) leader and Lalu Prasad Yadav's younger son Tejashwi said on Wednesday that law and order situation in Bihar would remain in shambles as state chief minister himself was an accused in murder case. "Naturally, the law and order situation in Bihar will be bad because the chief minister's name is an accused in a murder case. Chief Minister Nitish Kumar should give reply in the matter," said the former deputy chief minister. He further added that only two chief ministers in the country were facing murder charges. One is Nitish Kumar and other is Uttar Pradesh Chief Minister Yogi Adityanath, said Tejashwi, who is the Leader of Opposition in state assembly. Tejashwi said there was not a single day when people in Bihar do not open newspapers or switch on TV and not expect news of a new scam. Reacting to this Sushil Modi said Lalu Prasad Yadav should tell the house about benami property worth about Rs. 1,000 crore amassed by him.